How a snowball or an avalanche is related to compound interest? Know here. Everyone loves playing in the snow. People are excited when they encounter snowfalls. Holiday places such as Manali, Kashmir, etc., are famous majorly for their snowy weather. During the year-end and the start, most people love to visit these places to enjoy snowfall and the winter season with their family, friends, and loved ones. Enjoying the topic? Of course yes! The above talks are so exciting that everyone would like to know more. But, today we’ve brought something new for you guys. We’ll teach you about “The Power of Compounding” in mutual fund investments while enjoying the snowfall, i.e., taking the example of it. Have you ever wondered that what makes an avalanche so strong, powerful, and big? Do you know that before becoming a an avalanche, it was just a small piece of snow? A reality fact and truth is that small collective efforts can bring massive changes. Same is in the case of this massive snowball. Initially, it is a small piece of snow, but with some efforts, momentum and time, it rolls down and becomes larger. It acquires the power to break trees, smash articles, and injure human beings if they come in its way. The Power of Compounding works similarly. However, it doesn’t break trees, don’t it injure human beings, but it does the opposite to it, i.e., it helps people to build financial health over time. It also needs a small start to become massive wealth in future. Such as in the case of SIP. A small investment in SIP in the best mutual fund is a start to an avalanche. With the passage of time as the avalanche keeps growing by accumulating momentum and forces, your investment also grows with the help of compounding interest. The compound interest gives momentum and multiplying power to your investment. Thus, over a significant period of time, your investment gains larger size, and you create wealth. The ‘rule of 72’ is one of the mathematical facts about the compounding which let you calculate the tenure in which your investment get double of itself. It’s quite simple to calculate as you just need to divide the number 72 by the rate of interest you are earning on your investment. So, it’s just as simple as that. Simply divide the number 72 by the rate of interest, and you will get the required time period for which you need to stay invested to double your money. 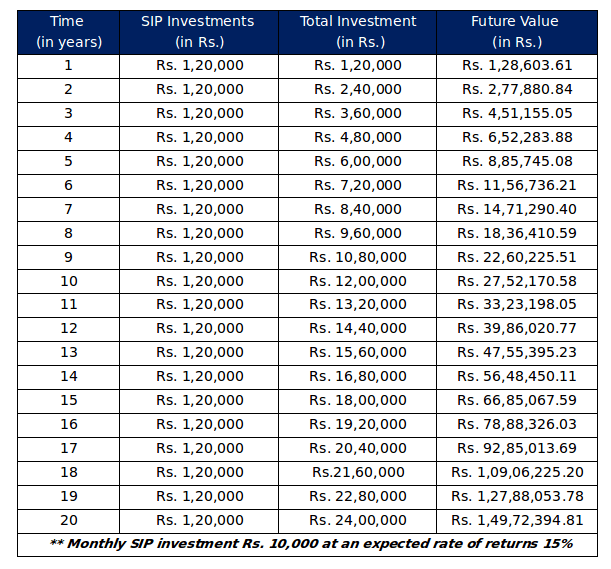 Figures in the above table show that on the monthly investment of Rs. 10,000 through SIP in mutual funds, you can earn a corpus of Rs. 1.5 crore (approximately). Your periodical invested value combines together and earns interest over the years. The amount each year rolls down to become bigger and earn more interest. Therefore, a constant and regular force toward any act can help you in performing better each time which is the case of avalanche also as we’ve learned in the starting lines. And, the same theory stands true in the case of earning compound interest. Don’t get any misunderstanding that the compound interest works only with SIP. It contributes its power even when you invest in another process like a lumpsum investment (provided rate of returns should be compound interest). However, with the other extensive benefits of SIP investment, you can grab an awesome deal to build wealth to meet your future financial requirements. Get associated with us to add more ease and benefits to the process of your online mutual fund investments. We, at MySIPonline, are keen to provide simplified investment solutions to our clients.